Tube bundle dryer is indirect contact dryer. The steam heated tube bundle rotates slowly in a stationary housing, the shovels elevate the product to be dried and convey axially throughout the dryer. Product gets in contact with heated tubes and dried. Variety of products can be dried in the tube bundle dryer which are non sticky, free flowing and non clogging. 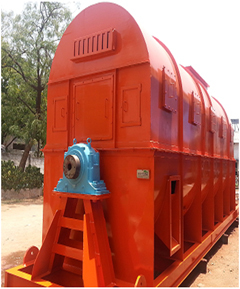 Depending upon application product recycling can be used for free flowing & can be dried up to 180 0C. The length, diameter & spacing of the tubes, shovel arrangements are designed depending upon production application. Low maintenance & easy installation.